Back on the homefront, I’m trying to make the best out of my last 3 days of my last spring break…ever! Because THE BOARDS are looming over our heads, I’m not really sure if I’ll be able to make it home for a visit before July – so my Mom decided to make the trek here to visit! Unfortunately, the weather was really awful in Cleveland (so much for spring), but my Mom’s a brave lady, and she tackled the snow to make the drive to Toledo. I’m really glad she did because we had a lovely day “fliting” around, and of course I wanted to make a special dinner for the evening. This dinner exceeded my expectations. I knew I wanted to make salmon – but salmon is such a hearty fish that I have trouble deciding what to do to make it special without overpowering its great flavor. While visiting my favorite “club” – Costco – I was flipping through Ina Garten’s new book, and saw a recipe using Panko with Salmon. Because I have also really been wanting to use Panko, I thought this would be the perfect opportunity to try it. I didn’t buy the book, so this is my own adaptation. It turned out to be really easy but it tasted, and looked gourmet (win-win!) I loved the lemon zest in the crumb coating, and you definitely shouldn’t skimp on it. I also think that salmon is one of the fish that you need to be careful to buy “Wild Caught”. It’s a little more expensive than the farm raised, but it’s a lot healthier and has a better flavor. For some fish – it doesn’t really matter, but salmon is not one of those fish. Panko crumbs can be found in any local grocery store, usually near the Asian food. In a small bowl combine the Panko, parsley, lemon zest and olive oil. Stir until well blended and Panko is evenly coated with olive oil. In an even smaller bowl, mix together 1 T. each of Dijon mustard and mayonaise. 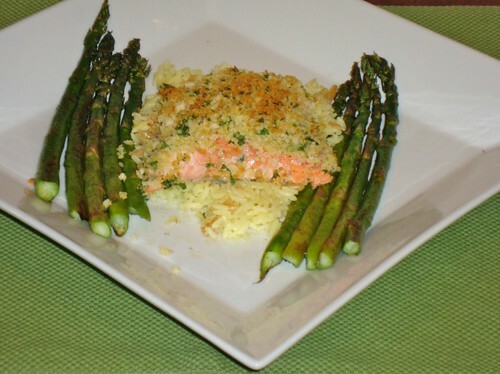 Place salmon filets on a baking sheet coated with aluminum foil. Sprinkle evenly with salt and pepper. Spread the Mayonaise and Dijon mixture evenly over the filet. Sprinkle the Panko crumb mixture evenly over the fish. The mustard mixture should help the coating to stick, but press to adhere. Bake the salmon for 10-15 minutes (Using a 1 inch filet 15 minutes was good for me). Serve with lemon wedges. Also good with rice pilaf and roasted asparagus. Inspired by How Easy Is That? by Ina Garten. This entry was posted on March 12, 2011 by Spice Is Nice. It was filed under Fish, Main Dish .